Quick Guide to DSLR Photography of all niche is written based on the frequent questions which are asked about in specific situations from wedding to candid. It is obvious that, within one article, everything not be written, that is the reason we have so many articles on Digital Photography. Quick Guide to DSLR Photography works great for a beginner to an expert alike – from a starting point to quick recall. The first is that, no matter what is the goal, you can take good pictures with any lens in any situation, you just need to be creative. And it is also true that, when we suggest a lens for a particular purpose, we have tested with totally different lens, took opinion of experts – which otherwise not possible for a normal person – honestly you can buy 10 lens in one shot. This is a professional fact that we can test the costly things and provide you a neutral opinion. All good professional websites do the same. But never get tempted to buy multiple lenses reading our 7-10 articles. Judge individually according to your need. Furthermore, especially for every situation you will expect to get certain types of photos, with certain aesthetic aspects. For example, the exultation of a player on foreground with a blurred background, a wide view of the beautiful landscape clear from the ground to the far away. Therefore, in this article you will find several recommendations about the features that should be aimed according to the applications. You will find recommended the most typical features, but know that there are always exceptions. Many photographic genres include pictures where there are peoples. Here we focus on photos that have people as the main subject. In general, when you want to photograph a person, you mean to give the right importance and focus on the subject (obviously). The technique preferred by all is creating a blurred background for this purpose. So, it is preferred to use a lens which is able to create a good blur effect. For this purpose it is useful to have a lens to reach a wider maximum aperture and higher focal length. For the opening – f2.8 or smaller are fine. You can also settle to f4 in the case of a telephoto lens that exceeds 100mm. The focal length actually depends, if you prefer telephoto lenses, those that exceed 70mm, when you reach the hundreds, the blur is often guaranteed. Furthermore, these lengths have an effect on more pleasant features of the faces, while the shorter ones create distortions and unpleasant effect like as if there is swelling of the nose or there is increase of the distance between two eyes! The focal length is traditionally choice for portraits 85mm. In fact, virtually every manufacturer in the catalog has a 85mm lens. When you want to photograph a single person and take it up entirely, you do not need to have a lens with too long focal length. Indeed, a focal length too high can make it difficult to make a full-length photo. In fact, you should create a distance yourself to do a lot of respect to the subject and sometimes the available space does not permit to perform so. So, for a full-length portrait you can do with a lens 35mm or 50mm. If you want a good focus, objectives so must have a very wide opening. Fortunately, there are models with a maximum aperture of f1.8 which are very cheap and universally appreciated. When people being photographed are many, you typically must avoid telephoto lenses. The pictures of the group in which they are used are those that include only two or three peoples. Instead, you can successfully use regular lenses. For really large numbers you may even need a wide angle lens. Often, for group shots wide open aperture is not a problem. When subjects position themselves on multiple lines, you have to get all of them in focus. There are three criterion that guide the selection of a lens for sports photography : it must be able to reach very short exposure times to freeze the action, it must isolate the subjects with blur (in most cases), it must be able to photograph from a distance, at the same time enlarging enough the subjects. In addition, if the sport is covered in dark, you need to be able to take pictures in low light. These requirements lead to two fundamental characteristics: a large maximum aperture and focal length that is very high. In fact, the photographers who typically are seen, for example on the sideline at a football game using gigantic lens typically uses a fixed lens of 300 or 400 mm, mostly aspherical. The maximum aperture is that these cases, reach around f2.8 to f4, in general. Many professional sports photographers, moreover, alongside these mega lens uses a camera with a short lens ! It serves great for the subjects when they approach closer (for example at the end of the match, or during exultation). Crucial in this photographic genre is the speed of focus, since you have to pursue subjects those are moving at very high speed. In this case the photography incorporates the entire buildings, not the finer details. For this kind of segment, small focal lengths works good; wide-angle is used to to catch them entirety. The wide-angle lenses , however, have a defect by optics – If the photographer is looking upward or downward at a short focal length (say 24mm on a full frame), surely the vertical lines will become skewed, due to the perspective distortion. To overcome this problem was solved, using the shift lenses were recomanded. It is extremely expensive solution, typically purchased by those who actually need to shoot architecture professionally. With the ability to be decentralized, these lenses allow you to shoot from below the buildings without perspective distortion. For the landscape, the lens that come to mind are the wide-angle to any lens. Much of the landscape photos are taken with this kind of lens, but not to exclude telephoto lenses, can still can create beautiful images. Apart from the short focal lengths, there are no special requirements for a lens to be used in landscape photography. Indeed, the openings used are usually quite narrow. Even stabilization is superfluous, since you always use a tripod. During a wedding practicing various photographic genres are actually combined. First of all are the portraits, which we wrote at the beginning of this article. Then, still life photo, flowers, details of food – all get included. Very beautiful is the current trend to photograph in a reportage style, to create a documenting of the ceremony and the party. Thus, a marriage requires great versatility and different lens which meet the requirements of various kinds of photography. A requirement is that the brightness of the lens. During the festival the light levels decline, its better to have maximum apertures of f2.8 or wider. For the same reason to lens need to have image stabilization feature. Typically, the choice of professionals lies with the zoom lens, in order to have the maximum versatility. Very popular are the 24-70, f2.8 and the 70-200, f2.8 Lenses. They are often accompanied by a normal fixed focal length lens, like the 50mm and / or a wide-angle (or ultra-wide angle) for photos of the church, the place of receipt, for larger groups. 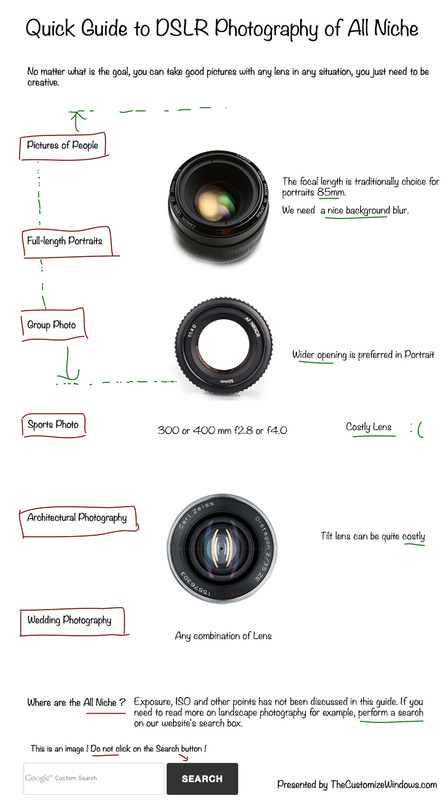 Quick Guide to DSLR Photography of All Niche : Where are the All Niches ? It is basically not possible to illustrate about all – we have covered the most common needs. For example, for Street photography, we have a good amount of articles itself, so is about concerts and theater, candid etc. But, practically you will see, except Macro (which we consider a fully different segment) the common lenses and method never goes beyond these basic niches. Obviously, Exposure, ISO and other points has not been discussed in this guide. If you need to read more on landscape photography for example, perform a search on our website’s search box with landscape or landscape photography. We have no control on search result – it is automated, determined by Google Search and based on how much they are popular. This is why we gave no link to other articles on this particle one. This Article Has Been Shared 8081 Times! Get correct exposure at every shot by reading about the exposure triangle and experimenting with manual, semi-automatic and automatic shooting modes on DSLR. Cite this article as: Abhishek Ghosh, "Quick Guide to DSLR Photography of All Niche," in The Customize Windows, July 15, 2013, April 25, 2019, https://thecustomizewindows.com/2013/07/quick-guide-to-dslr-photography-of-all-niche/.